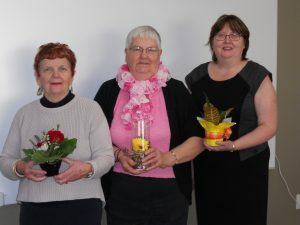 Judy Misick, Lynda Moses and Alva Andersen (pictured from L to R) were honoured at the CLASS AGM meeting on Wednesday, October 28, 2015 at Lakeland College’s CSI facility. Judy has been a fitness instructor with CLASS since 1986, almost 30 years. She was honoured for her commitment in making the Vermilion River County a better and healthy place to live. Unfortunately, with the change of government funding and the increase of our fees, we were no longer able to have Judy’s fitness classes at CLASS. Lynda Moses joined CLASS in 2009 and came with a willing heart to help CLASS and do whatever she could to support us. Her kind heartedness lead her to CLASS, but she is saying goodbye after 6 years of volunteer service to do other community work. Alva Andersen has been a CLASS Board member since 2004. She has been an active member as a director, treasurer, Vice Chair and helper with fundraisers and promotions over the years. She has been a key pillar in keeping CLASS as a healthy and active non-profit organization, and this is a well overdue appreciation of her volunteer work. All the recipients received a small token of appreciation for their faithful and dedicated service to CLASS in promoting lifelong learning and literacy. CLASS welcomed Judy Misick and Gary Walsh as part of the 2015-16 CLASS Board at our AGM meeting. CLASS continues to grow and develop in foundational learning and Newcomers to Canada support. Volunteers are always welcomed. For more information about CLASS and our work, please visit the CLASS office.